Sometimes on a cold winter night, Highlander has a hot nightcap—a decaffeinated Irish coffee. His favorite flavors of chocolate, coffee and Bailey’s (Irish cream liqueur) with a shot of whiskey is a relaxing drink at the end of a long work day. He also indulges in Irish coffee cupcakes as an occasional after-dinner treat. They are among his favorite desserts, along with the Irish cream liqueur cake that he often requests for his birthday. 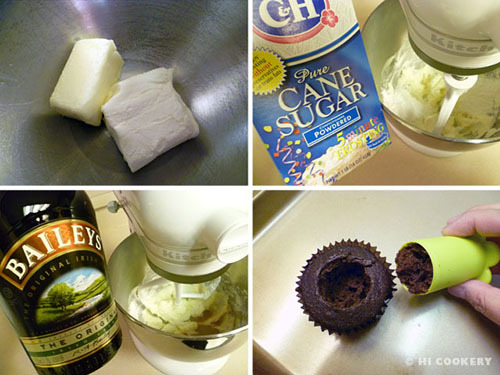 Irish coffee cupcakes are ideal for National Irish Coffee Day as well as St. Patrick’s Day. In a bowl, combine the flour, baking powder, baking soda and salt. Set aside. 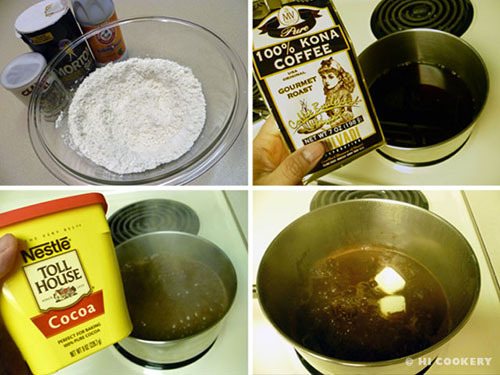 In a saucepan over medium heat, mix together the coffee and cocoa. Add the butter and stir until melted. Add the brown sugar and cool to room temperature before beating in the eggs. Stir in the vanilla. Gradually add the flour mixture and stir until the batter is smooth. In a bowl, beat the cream cheese and butter together until light and fluffy. Gradually add the powdered sugar. 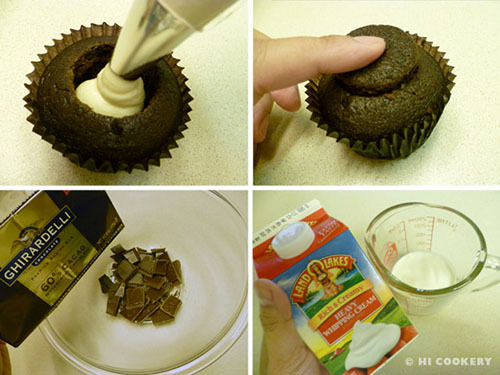 Stir in the Irish cream liqueur until the filling is smooth. Core the cooled cupcakes. Pipe the filling in the center. Replace the cores and press down to flatten the tops slightly. Chill in the refrigerator for 10-15 minutes to set the filling. 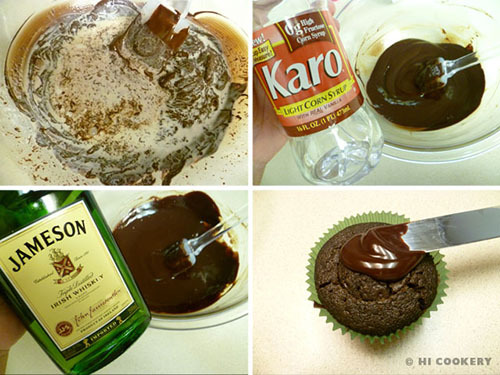 Make the Irish whiskey chocolate glaze. 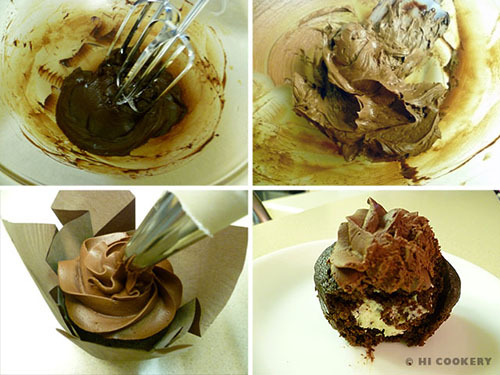 In a microwavable bowl, melt the chocolate. Stir until smooth. Then pour in the cream. Mix until incorporated. Stir in the corn syrup or agave nectar and Irish whiskey until smooth. 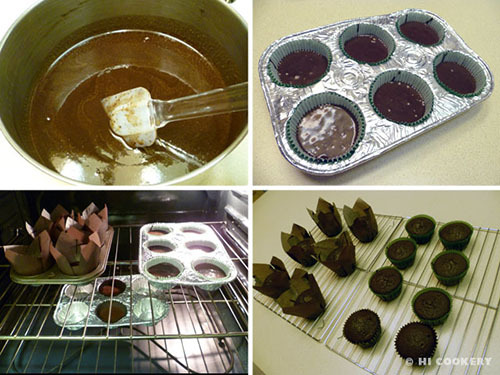 Frost with a spatula or dip the tops of the cupcakes to coat. Let the chocolate glaze set. 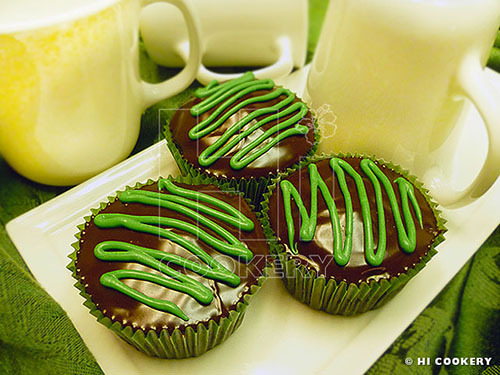 Drizzle melted green confectioner’s candy on top (optional). 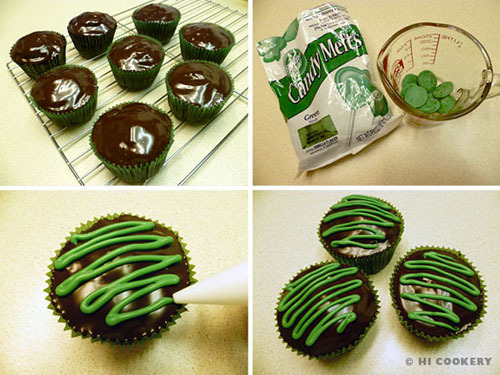 We used Wilton brand green candy melts to drizzle on top of the cupcakes. 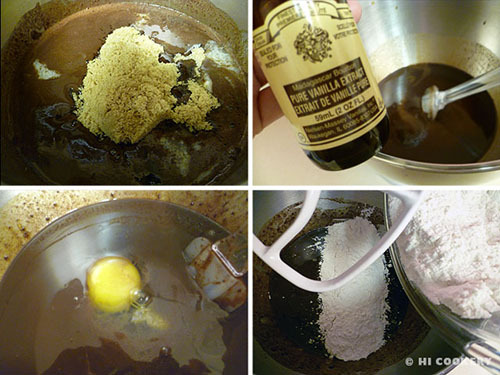 An alternative to the Irish whiskey chocolate glaze is a whipped ganache frosting. Simply cool the glaze to thicken at room temperature and beat until light and fluffy. Place in a decorating bag. We used Wilton tip 1M to pipe swirls on top of the cupcakes. Optional: Sprinkle green shamrock shapes or non-pareils on the frosting for a festive food.